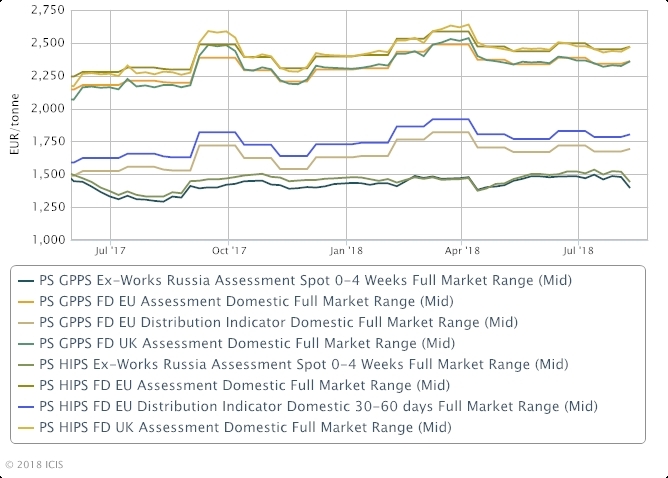 LONDON (ICIS)--The European polystyrene (PS) market remains unfazed by upstream woes amid subdued activity due to summer holidays, with contract negotiations for August barely moving forward. Early contracts settled in line with an unexpected €20/tonne jump in styrene monomer costs for the month and most players expect business to be settled close to this level for the month overall. Buying interest has been somewhat subdued because of the summer holidays and demand has been described as flat, at best, or weak, depending on the region and downstream sector. Despite ongoing supply issues in the upstream styrene market in Europe, PS availability has remained balanced with rates dropping in line with the reduced buying appetite. Most players expect prices could face further upward pressure in September due to the sizeable rise in styrene spot prices. Since the barge contract settled for August, spot values have climbed by over €100/tonne, as multiple availability problems have affected that market. Some anticipated imports from the US could potentially soften spot prices, but the size and arrival dates of any imports are still unclear. Demand is also expected to pick up again in September as the holiday season ends. If upstream supply problems persist, the PS market could feel some tightness next month. General purpose PS (GPPS) is used in food packaging, disposable utensils, cutleries and various other consumer items. High-impact PS (HIPS) is used in consumer electronics and toys.